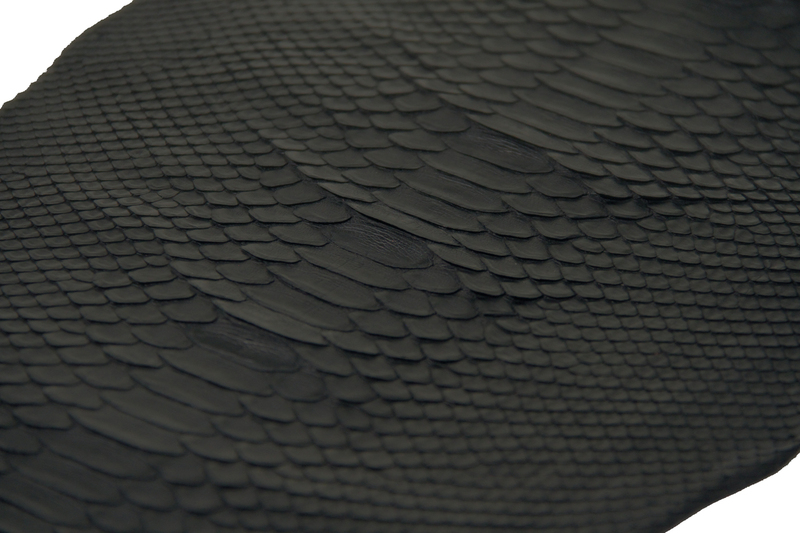 Pythons have beautiful, extremely durable skins that lend themselves to diverse applications. Long valued for their elegance and durability, Rojé Exotic Leathers stocks over 150 unique colors and finishes in the U.S. as well as 2000 skin in crust awaiting your production order in both front cut and back cut. A common misconception, as portrayed by various animal rights activist groups, suggest that all python skins are hunted and killed alive only for their skin, this is not at all true. Anyone that has ever traveled throughout Asia will know this and possibly have eaten BBQ python on a stick. Skins are culled from the wild each year and traded with strict quotas. Each year over 300,000 reticulated python skins are legally traded under the CITES authority. All of the python skins that Rojé offers abide by origin country laws, as well as U.S. State and Federal laws. 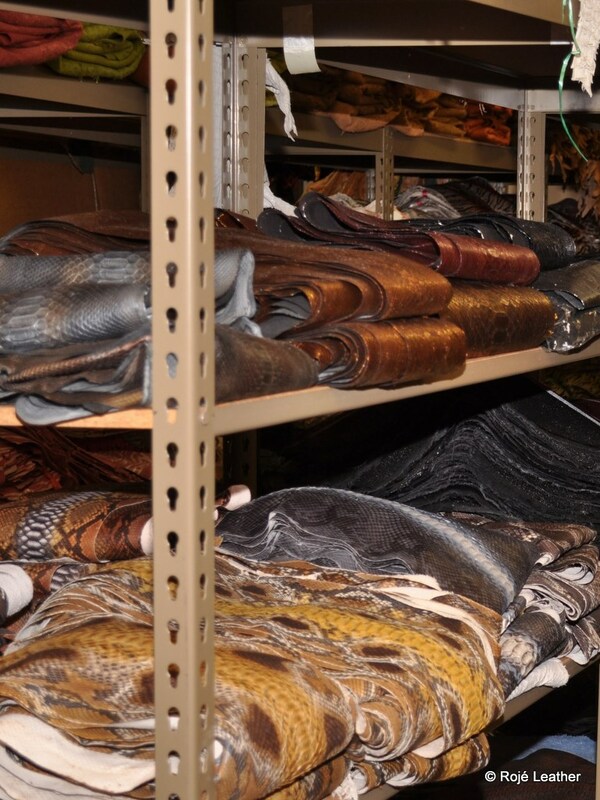 CITES officials inspect prior to leaving the origin country, at our tannery, and prior to entering into the U.S. or final destination country. We stock and offer both Indonesian and Malaysian origin python skins; this is important only for EU customers: EU customers will have their skins or products made from Malaysian origin skins confiscated if shipped with a Malaysian CITES, as there is still an active ban in the EU. We also adhere to California State law and will not ship to any California address. There are two different cuts of python available in today’s marketplace; front cut and back cut. The back or front incisions made when opening the skin determine the cut. The production of front cut vs. back cut is based on market demand and feedback from previous seasons. Today, more back cut skins are in demand. There is no quality difference; only personal tastes and preferences. Front Cut python skins have their belly scale off to right and left side. Popular uses are furniture, belts, boots, and wallets. Back Cut python skins will have the belly scale in the center. 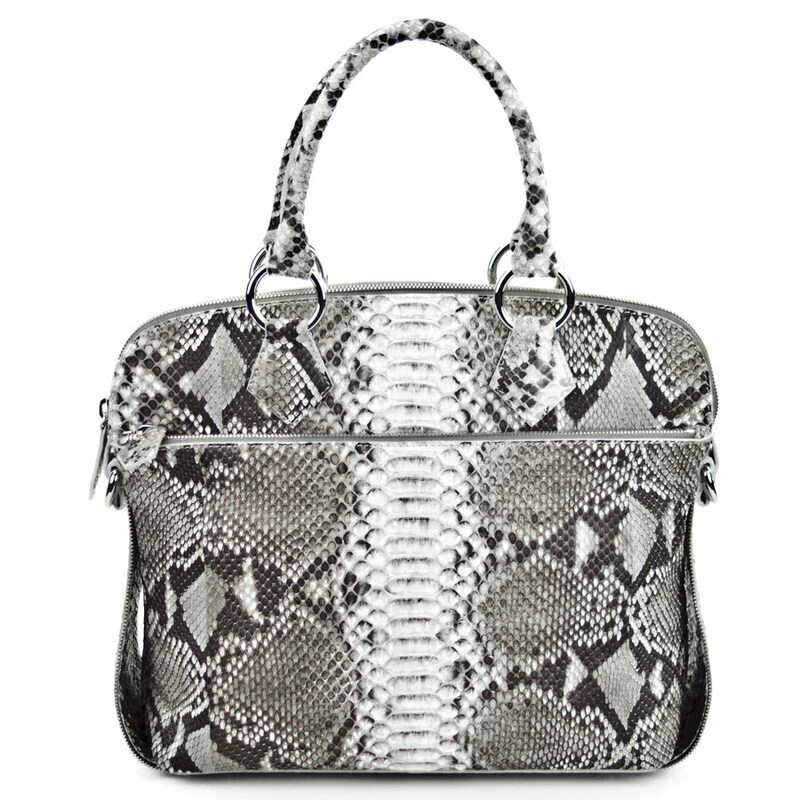 Back cut python skins are also referred to as belly skins and are more popular in high fashion and dominate the handbag industry with their 3 dimensional look. The Bleaching process removes the natural markings commonly known as the diamond effect. This is determined once the skins have been harvested and preparing for the per-color or the crust stage. Both styles are equally available. Depending on your preferences and the desire for uniqueness within your target market, determine if you prefer a transparent natural marking embedded below the color you choose. Glazed skins are also referred to as shiny. Matte skins don’t have a glaze and can also be customized to garment grade by adding more oil during the final stages of tanning for a modest surcharge. The more mature the python becomes, the wider and longer the actual skin will be. The basic rule of pricing is calculated by the size, noting that the animal requires more food consumption to maintain its growth, as well as sustain itself in wild conditions for an extended period of time. In our industry, we measure from the widest point of the skin across in cm (2.54 CM equals 1 inch). As international traders, we use the metric system as our universal system of measuring and valuing exotic skins. Pythons live in southeastern Asia, the East Indies, Africa and Australia. Pythons live in rugged tropical regions that have heavy rainfall and forests, or low dense vegetation. Almost every species swims and climbs well. The reticulated python of southeastern Asia are the most ethical and globally traded commercial species. Python skins from the East Indies, and the African Rock Python may grow up to thirty feet in length, however, are harvested in questionable ways. Only the giant Anaconda of South America is longer. The Amethystine Python of Australia and the East Indies and the Indian Python of southeastern Asia grow about twenty feet long. All Pythons hatch from eggs and the number of eggs varies with some species laying as many as a hundred at a time. According to ancient Greek mythology, a large serpent began killing people and their cattle in the ancient city of Delphi. The Greek god Apollo (Mercury in Roman mythology), when he was only five days old, killed the great serpent with his arrows. When it was discovered that the Python is one of the largest snakes found in nature, it was only appropriate that the species was named after the ancient serpent from Greek mythology.